The following is a list of stainless steels commonly used in valve construction. This list includes types of stainless steels as well as cross references of equivalent types of cast and forged stainless steel grades covering ASTM and EN, and valve standards associated to them. High resiliency at low temperatures (-200°C). 70% of stainless steel production is austenitic. Better chemical resistance than martensitic stainless steels. Good resistance to corrosion from weak acids. Duplex Steels are a mix of austenitic stainless steel (about 40% to 50%) and ferritic steel (about 50% to 60%). Good mechanical properties and corrosion resistance. Refer below cross reference chart valve ASTM duplex grades and equivalent cast, forged materials. Also click here for alternate Duplex Cross Reference. This specification covers steel castings, martensitic stainless steel and alloys steel castings for valves, flanges, fittings, and other pressure-containing parts intended primarily for high-temperature and corrosive service. The grades of steels covered here are: Grade WC1, Grade WC4, Grade WC5, Grade WC6, Grade WC9, Grade WC11, Grade C5, Grade C12, Grade C12A, and Grade CA15. Heat treatment shall consist of normalizing and tempering for Grade C12A and tempering for all other grades. Heat treatments shall be performed after castings have been allowed to cool. Heat and product analyses shall be performed wherein specimens shall conform to required chemical composition of carbon, molybdenum, chromium, nickel, vanadium, manganese, phosphorus, sulfur, silicon, columbium, nitrogen, aluminum, copper, titanium, tungsten, and zirconium. The surface of the casting shall be examined visually and shall be free of adhering sand, scale, cracks and hot tears. Steels shall undergo tension test, and shall conform to the following mechanical requirements: tensile strength, yield strength, elongation, and reduction of area. This specification covers austenitic-ferritic (duplex) stainless steel castings for valves, flanges, fittings, and other pressure-containing parts. The grades of steels covered here are: Grade 1B, Grade 2A, Grade 3A, Grade 4A, Grade 5A, and Grade 6A. The steel castings shall be heat-treated up to required temperature and shall undergo water quenching or rapid cooling by other means after heating. Heat and product analyses shall be performed wherein specimens shall conform to required chemical composition of carbon, manganese, silicon, phosphorus, sulfur, chromium, nickel, molybdenum, copper, tungsten, and nitrogen. All steels shall undergo tension test, and shall conform to the following mechanical requirements: tensile strength, yield strength, and elongation. This specification covers centrifugally cast ferritic/austenitic steel pipe intended for general corrosive service. These steels are susceptible to embrittlement if used for prolonged periods at elevated temperatures. The pipe shall be made by centrifugal casting process and furnished in the specified heat-treatment condition. The pipe shall also be machined. The grades shall conform to the required chemical composition for carbon, manganese, phosphorus, sulfur, silicon, nickel, chromium, molybdenum, nitrogen, copper, and cobalt. Heat analysis and product analysis shall be done. Tensile requirements shall conform to the specified tensile strength, yield strength, and elongation; and hardness requirements shall conform to the specified Brinell and Rockwell C values. Tension test shall also be made. This specification covers standard requirements for iron-chromium-nickel alloy, stainless steel castings intended for particularly severe corrosive applications. Alloys shall be melted by the electric furnace process with or without refining such as argon-oxygen-decarburization. Castings shall be heat treated and shall conform to the required heat treatment conditions. The materials shall conform with the prescribed chemical requirements for carbon, manganese, silicon, phosphorus, sulfur, chromium, nickel, molybdenum, columbium, copper, selenium, tungsten, vanadium, iron, and nitrogen. Technical delivery conditions for steel castings for pressure purposes. Part 4: Austenitic and austenitic-ferritic steel grades (Q). EN 10213:2007 applies to steel castings for pressure containing parts. It includes materials which are used for the manufacture of components, for pressure equipment. EN 10213:2007 relates to castings characterised by their chemical composition and mechanical properties. It applies where castings are joined by welding by the founder. EN 10213:2007 does not apply in cases where castings are welded to wrought products (plates, tubes, forgings), or by non founders. Typical Austentic Stainless Steel Grades – 19%Cr + 10% Ni have been adopted in corrosion resistant applications for decades. In accordance with more stringent service demands, Austentic stainless steel is not suitable for more severe environments. Stronger and more corrosion resistant materials are available. Valves in materials like Alloy 20, Hastelloy, Monel & Duplex are stocked and now supplied by GSL. A stainless steel contains a minimum of 10.5% chromium because this level of chromium causes the spontaneous formation of a stable, transparent, passive, protective film. 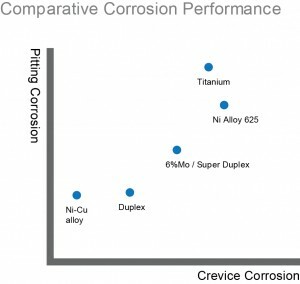 Increasing the level of chromium enhances corrosion resistance. At elevated temperatures, chromium provides resistance to oxidation and sulfur-containing and other corrosive atmospheres; contributes to high temperature creep and rupture strength; and, in some alloys, increases resistance to carburization. Nickel in stainless steels promotes the stability of austenite. Austenite is stronger and more stable at higher temperatures then ferrite. Less nickel is needed to retain an austenitic structure as the nitrogen or carbon levels increase. When sufficient nickel is added to a chromium stainless steel, the structure changes from ferritic to austenitic. Adding nickel improves toughness, ductility and weldability. Nickel increases resistance to oxidation, carburization, nitriding, thermal fatigue, and strong acids, particularly reducing acids. It is an important alloying element in stainless steel and nickel-base alloys used for corrosive and high temperature applications. 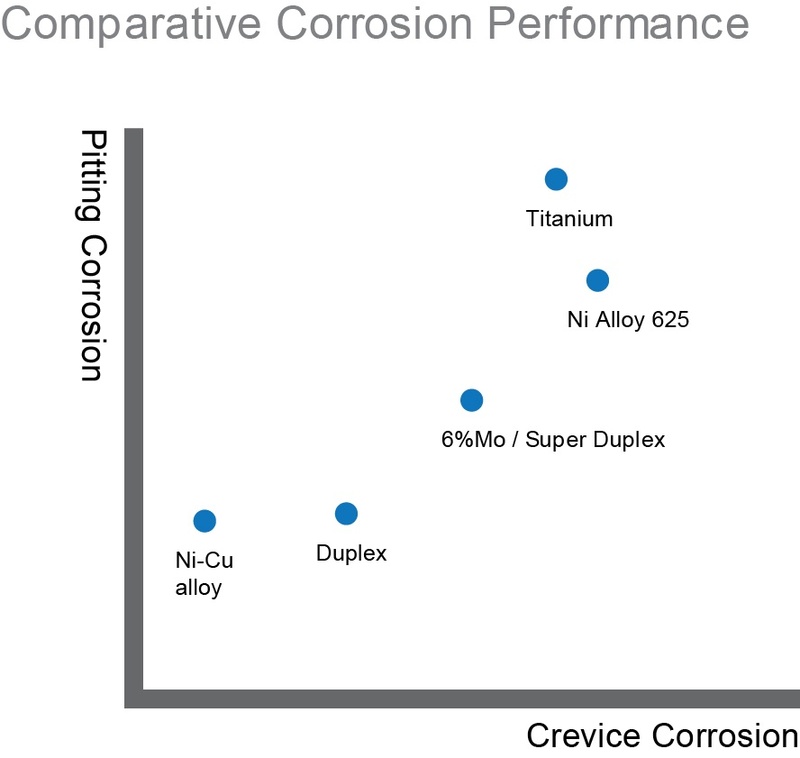 Molybdenum additions improve resistance to pitting and crevice corrosion in chloride containing environments and corrosion by sulfuric, phosphoric, and hydrochloric acids. The elevated temperature mechanical properties of austenitic stainless steels and the strength. At Global Supply Line the same knowledge and effort we put into the web site goes into every product we sell. If this website helps you, please reward GSL with your business. If we don’t have the valve in stock we can source it from our overseas network of stockists and very short lead-time specialty manufacturers. We can even stock and source exotic grades like Nickel, Super Duplex F55 (6A/CD3MWCuN), F51 (4A/CD3MN), Monel (ASTM A494-M35-1), Hastelloy C (ASTM A-494 CW12MW), F317 (CG8M) etc. in short lead-time.